I Love IBIZA Badges featuring the text I Love Ibiza and a massive red love heart. 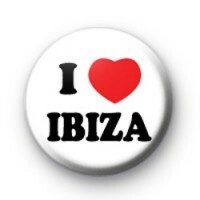 If you love to party on your summer holidays on this beautiful island this is the badge for you. Also great for lads & girls holidays and hen & stag parties. Perfect for DJ's and dance music lovers. These 25mm button badges are hand made in our workshop & are composed of metal with a plastic coating on the front and copper pin back.